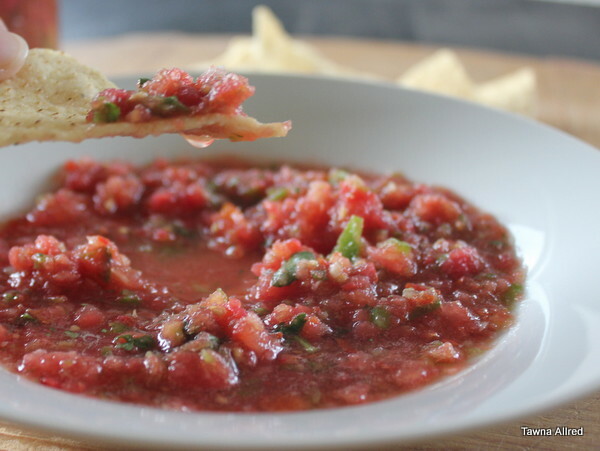 I know I’ve written a post about “cheater” salsa. It’s great for when you’re in a rush. However, I can make “real” salsa too. I know, you are relieved. It’s taken me a year or so, but I think I’ve finally got a recipe I like. Up until now, I’ve had to beg a friend for her amazing salsa and jaiva (thanks Stacie)! I still don’t know how to make jaiva, but here is the recipe for my salsa. I think the quality of ingredients you make your salsa out of is just as important as the ratios. In other words, avoid those cardboard Roma tomatoes when they are out of season at your local supermarket. 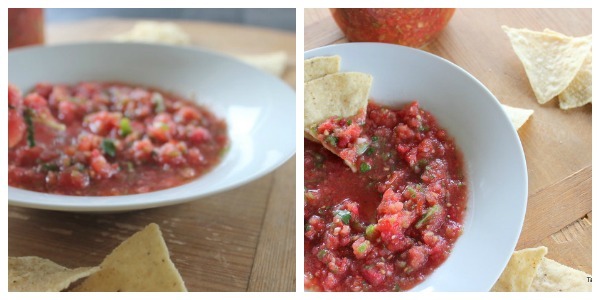 Grab the ripe tomatoes from your garden or farmers market, and you’ll have better salsa. Also, homemade salsa has a lot more water around it. I stir it together, then I let it sit in a strainer with small holes for awhile. Enjoy! Put tomatoes, peppers, onion, garlic, and cilantro through a pulsing machine (don’t blend). Place in a large bowl. Squeeze the juice out of one lime into the mixture. Stir together, then add salt to taste. Serve immediately or can. Stays fresh in your refrigerator for 3-4 days.